Investors betting on United’s turnaround strategy have pushed the carrier’s market capitalization to $22.8 billion, nosing ahead of American’s for the first time since the spring of 2014. United Continental Holdings, the longtime laggard of the U.S. airline industry, just passed American Airlines Group in an important yardstick: market value. Investors betting on United’s turnaround strategy pushed the carrier’s market capitalization to $22.9 billion at the close Thursday, nosing ahead of American’s for the first time since the spring of 2014. 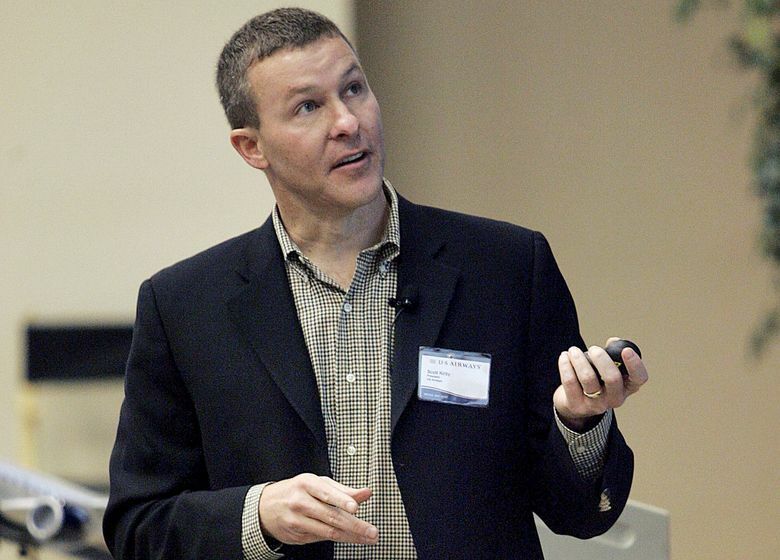 Fueling the stock gains: a belief that United’s new president, Scott Kirby, will juice revenue. Chief Executive Officer Oscar Munoz brought on Kirby in August from American, where he had the same title. “It’s a recognition that Kirby is bringing his playbook over to United and doing some good things,” said Kris Kelley, an analyst at Janus Capital Management, which owns shares in the Chicago-based airline, American and Delta Air Lines. Delta is No. 1 by market value. United has advanced 54 percent since Aug. 29, the day it announced Kirby’s appointment as president, compared with a 22 percent gain at American, the world’s biggest airline by traffic. United continued closing the gap in mid-November when it outlined a turnaround plan. United also has outpaced a broader Bloomberg index of U.S. airlines, which has climbed 35 percent. “I really think that is attributable to investors not as much coming off of American, but people getting onto United with Scott Kirby,” Kelley said. Representatives of the airlines didn’t respond to requests for comment. United still trails American and Delta in average airfare received per mile in the U.S., so its renewed focus on domestic operations provides more room for improvement, said Bloomberg Intelligence analyst George Ferguson. “There may be a view in the marketplace that if they can bridge part of that gap, that will be good for the stock as well,” he said. The carrier’s surge has erased a $4 billion difference in market value with Fort Worth, Texas-based American since Kirby was named. Both carriers still lag far behind Delta’s $34.9 billion. Kirby is part of an overhauled management team assembled by Munoz, who took over in September 2015. The group, which includes a new chief financial officer, has drawn up a blueprint to catch Delta’s profit margin by 2020 through $4.8 billion in revenue and cost-saving initiatives. Kirby has had a central role in shaping and communicating the plan to investors, analysts and employees. He has promised to boost connecting flights at some hubs and improve its out-of-date revenue-management system, which determines how many seats to make available at which prices. He also wants to win back market share in some key cities. Kirby recently told pilots of plans to expand at Los Angeles International Airport, Bloomberg News reported last week. To be sure, the total value of American far exceeds United’s when accounting for debt as well as stock. American’s enterprise value, as the measure is known, is about $41 billion to United’s $29 billion, according to data compiled by Bloomberg. Nevertheless, some investors see United as less risky than American, said Cowen & Co. analyst Helane Becker. Flights across the Atlantic historically have been moneymakers for airlines, but those fat profits have come under pressure from a flood of cheap flights from European low-cost airlines. American’s joint-venture partner on trans-Atlantic flights, British Airways, is particularly vulnerable, she said. American also issued a weak earnings forecast last week on rising labor costs. That sent its shares into a slump, pushing its market value closer to United’s. American has more cash than United: $6.36 billion versus $4.86 billion at year end, according to data compiled by Bloomberg. But American’s debt load of $21.5 billion through the third quarter, accumulated through jet financing, also is cause for concern, Becker said. United’s debt level was about half American’s figure.